Many Executive MBA applicants already have Master’s degrees, and some have PhDs or other terminal degrees (MD, JD). A terminal degree generally implies that an applicant has what it takes to be successful as a student, making the test less relevant to their candidacy overall. A Master’s degree is not quite the same, but close, especially if the candidate has some professional work experience before, during or after earning this degree. Tip: If you have an expired GMAT or GRE from a Master’s degree, send us your copy of the score report and skip the waiver petition! So if it’s just a bachelor’s degree? For the Admissions committee that’s a little trickier. How long ago was the degree earned? What and how rigorous was the program and the institution? And how were the grades in specific classes and overall? What level of authority and responsibility has the candidate achieved professionally since undergrad? All of these areas will be under consideration. You probably already know this, but some people reach the C-suite or General Manager level without graduate education. People around these levels, depending on the organization, have budget authority and accountability, people and/or project management responsibility, and are leading the business strategy in a specific area or overall. Generally, the level of authority and responsibility someone has within a company correlates positively to how they’ll perform in a rigorous graduate educational program. And it usually takes some time to achieve this career level. So plotting between that X and Y axis is the test waiver probability. The closer you are to zero, the less impact your work experience will have on your petition to waive the exam. If you’re still wondering how this applies to your particular situation and you feel like you need more information before deciding whether or not to take the exam, here’s some advice: Accept some ambiguity. And we are always open to answer questions or chat with you about your application– just reach out. Candidates without graduate or terminal degrees and work experience that doesn’t include management, should seriously consider submitting an Executive Assessment (EA) score. EA is an exam recently created by the same organization that created the GMAT, and it’s built specifically for Executive MBA programs and candidates. Currently over 40 schools are accepting this assessment. The EA is similar to the GMAT, and tests integrated reasoning, verbal and quantitative skills. Unlike the GMAT, the EA is only 90 minutes and taking an exam can allow you to demonstrate your commitment to your continued education, and in turn help you gain a more competitive edge for your candidacy. The MBA Admissions committee views each applicants’ petition in the context of their entire application, and renders a decision on the application versus a separate decision on just the waiver. There may be other pieces of information that influence waiver consideration either positively or negatively. This could include career path and trajectory, recommendations, experiences outside typical work experience (including community involvement/leadership and entrepreneurial pursuits), and even personal history reflected in the essays. And let’s not forget the petition itself. Candidates who write strong petitions have taken some of the guesswork out of the equation by explaining in detail exactly why a test isn’t necessary. After evaluating all the components of a candidate’s file, the Admissions Committee makes one of three decisions: Admit, Deny or Waitlist. 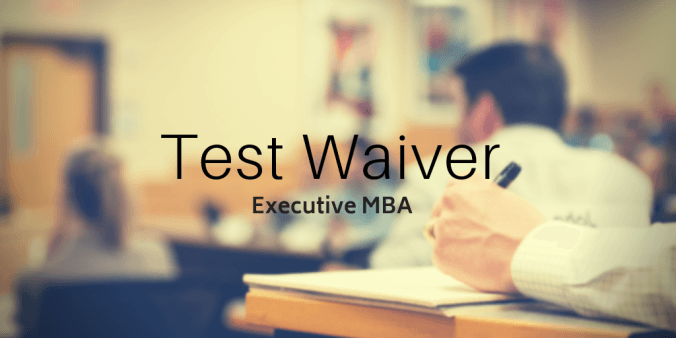 If you find yourself on the Waitlist and you petitioned for a waiver, a test score might help your application to the Executive MBA. If you still have questions about the waiver or the admissions process, we’re here to help. My best advice is to trust the admissions process and submit the strongest application you can as soon as it’s ready, whether it includes a score or not. Good luck and hook ’em!